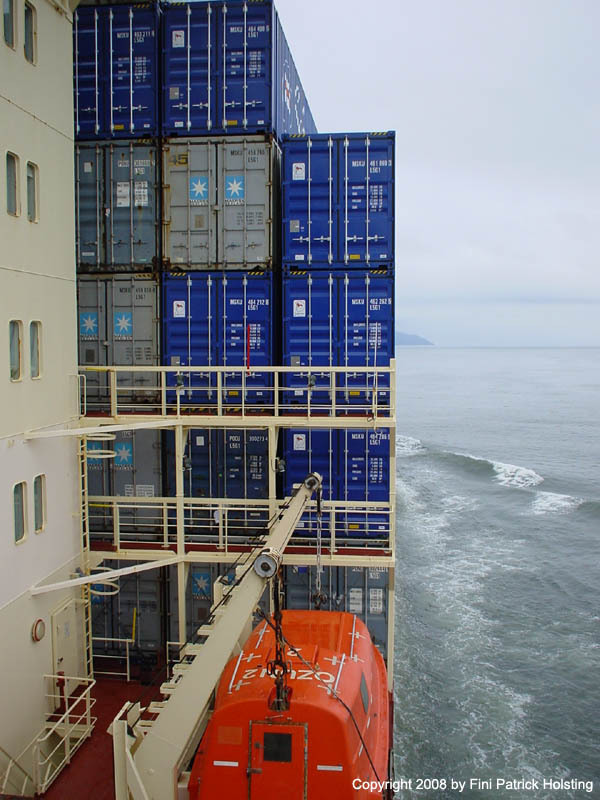 The Sofie Maersk is one of the Maersk S-class container vessels, and I joined her for 6 weeks on a summer holiday trip in between two school semesters. 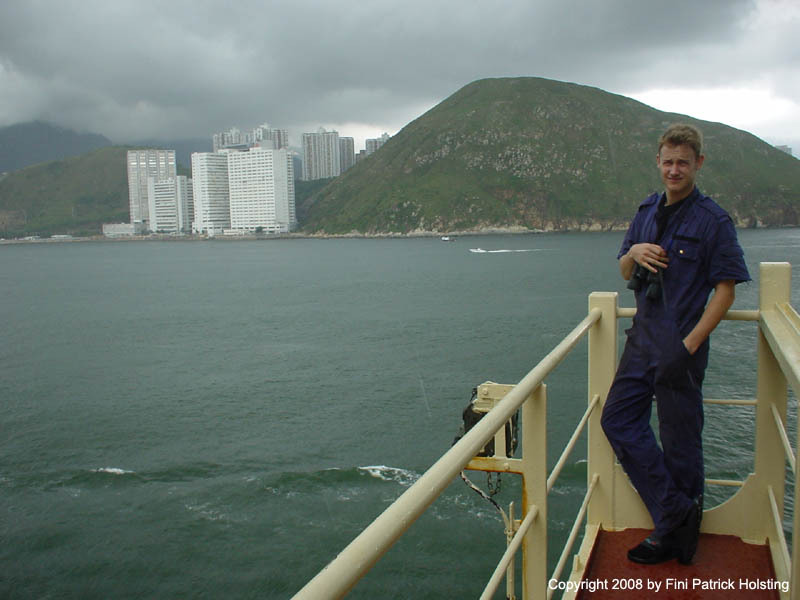 I joined the ship in Tanjung Pelepas, Malaysia, and after a brief stop in Yantian, China, we called Hong Kong, a first for me since 2002. Even though it was raining, it was still a good opportunity to take a break from engine room work and watch the approach from deck. 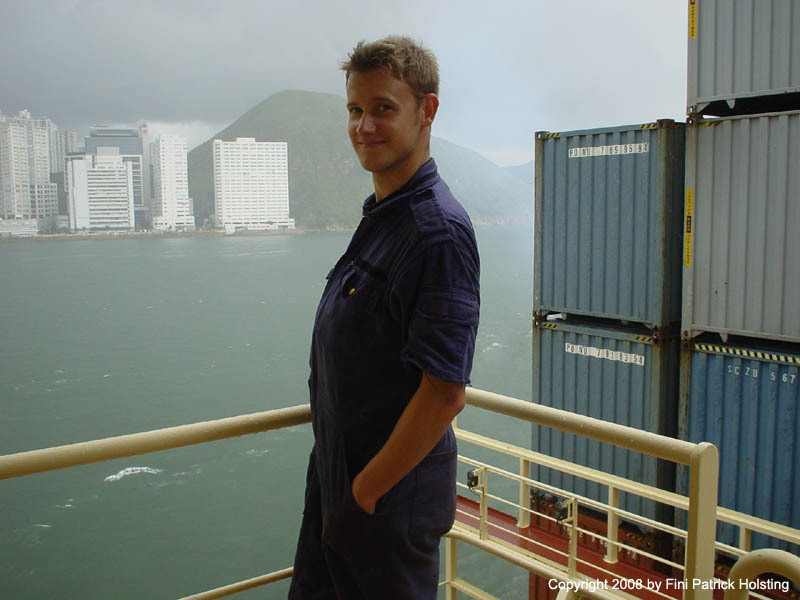 A drizzle ment I had to hide my binoculars inside the boiler suit, as we moved ever closer to Hong Kong. I wasn't the only one who found time to have a look outside. 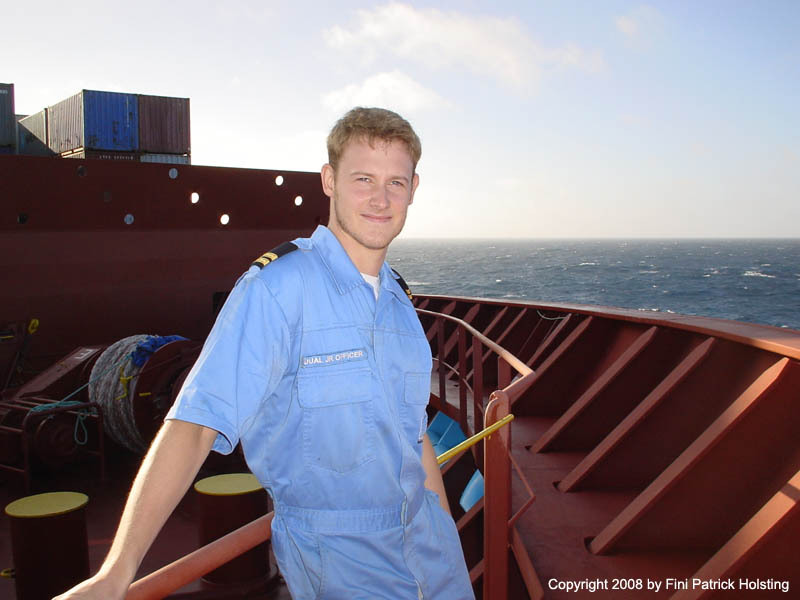 Also Chief Steward Martin and above him Captain Henrik came out to look . 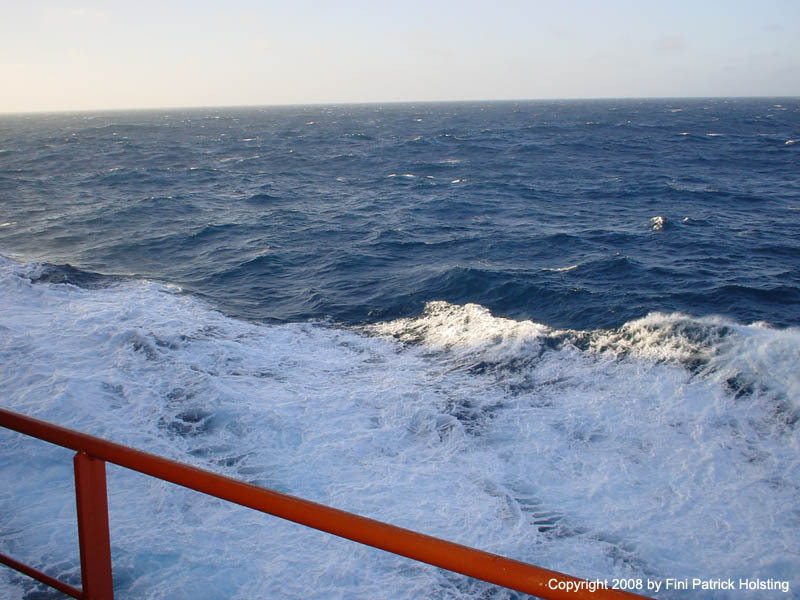 Overlooking the starboard life boat as we slowly turn starboard to head towards the port. 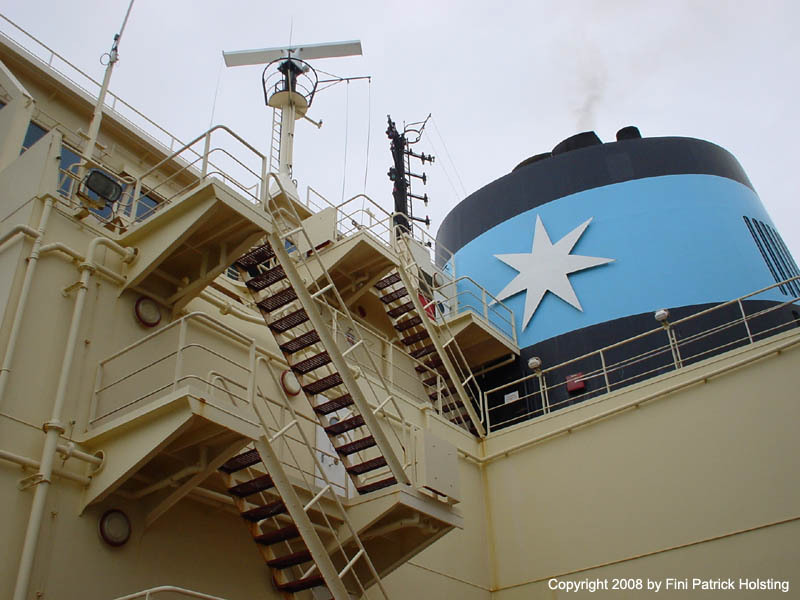 The OZUN2 on the life boat is the call sign for Sofie Maersk. 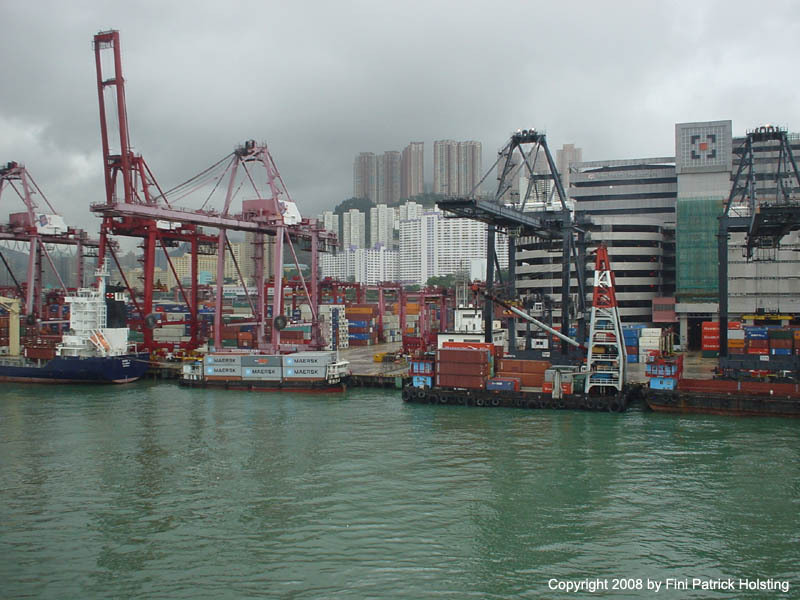 The walking bridges by the container stacks are meant for easy access to reefer containers, though at the time there were no reefers in those positions. 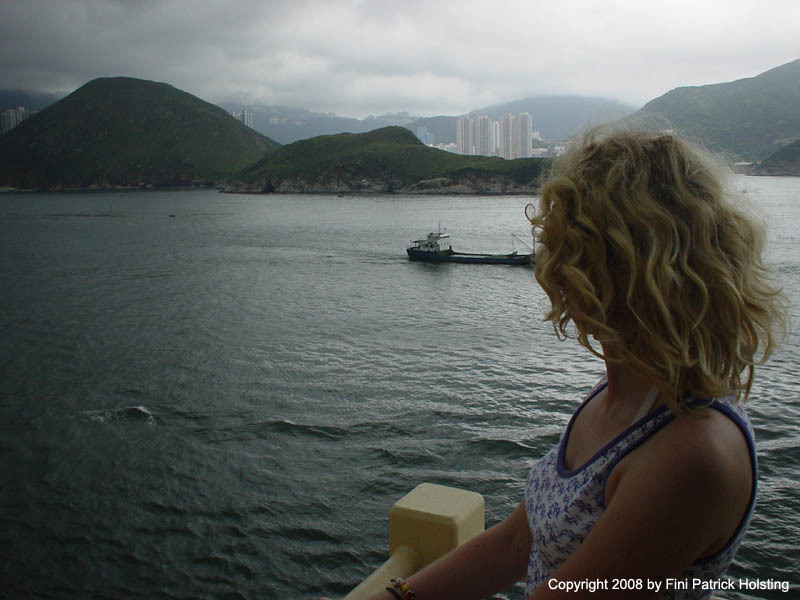 Coastal traffic increasing as we approach the busy port area, Maria ignored the rain for a bit of sight seeing. 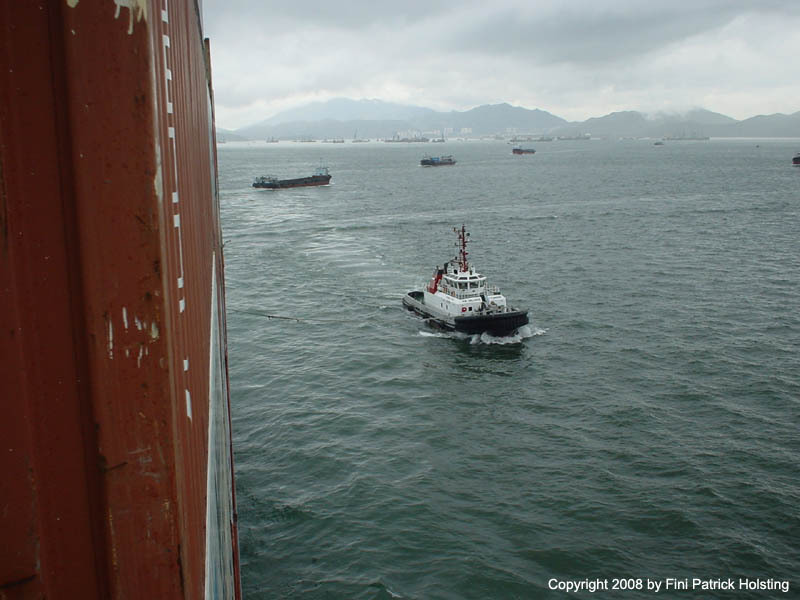 Tug boats came to our assistance once we got nearer the port. 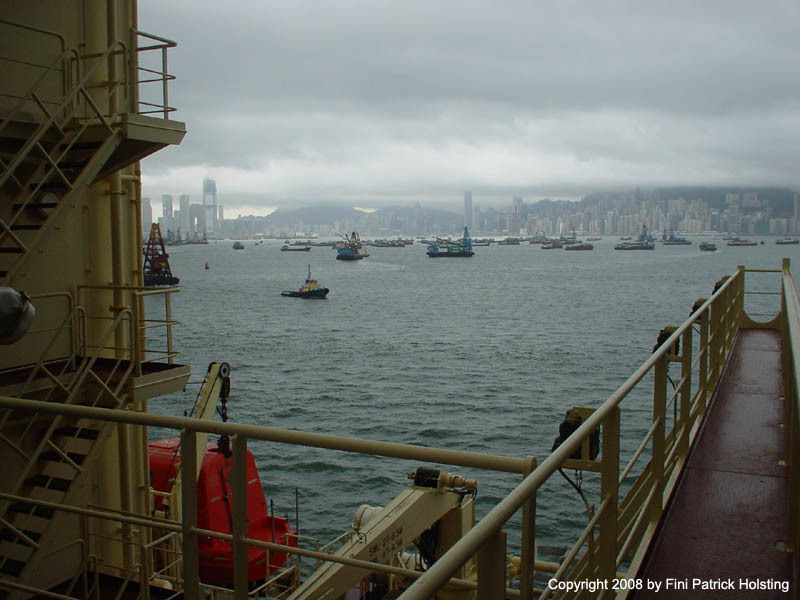 Although tug boats are not always necessary, they are very often mandatory for safety reasons. 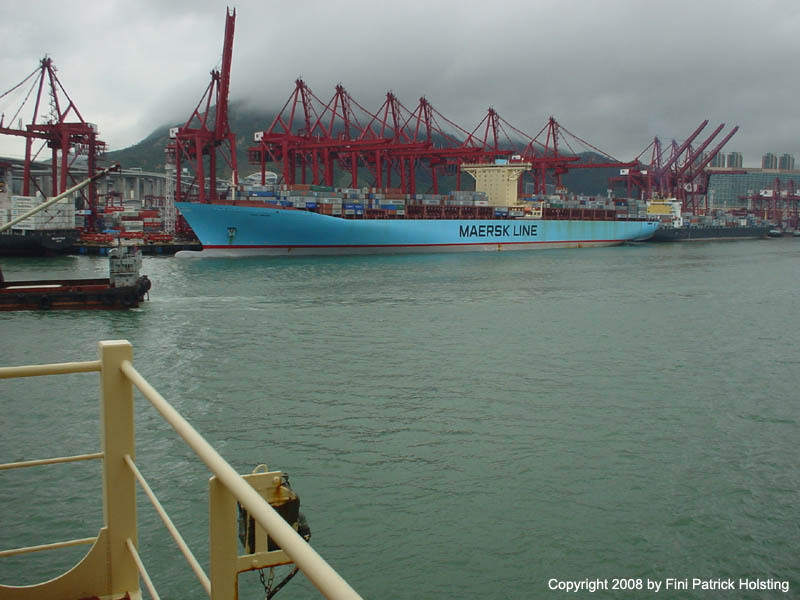 Interestingly, several of the small boats were painted a shade of blue, which seamed very familiar to a Maersk employee. 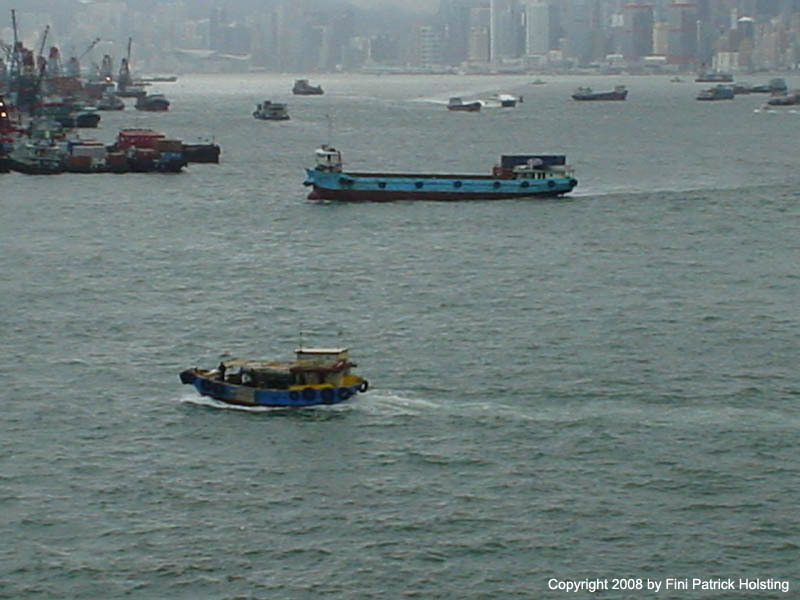 A dramatic increase in coastal traffic is a sure sign that Hong Kong is now close. 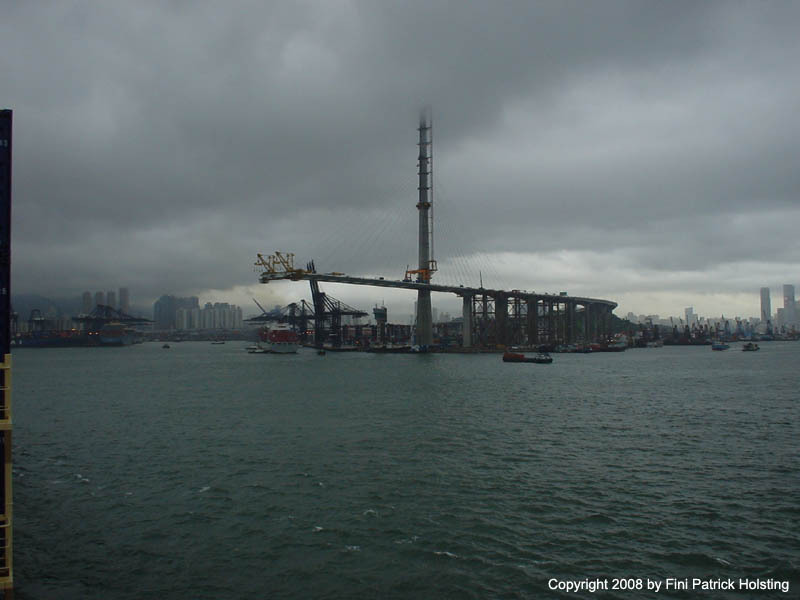 The unfinished Stonecutters Bridge reaching for the low cloud cover over Hong Kong. 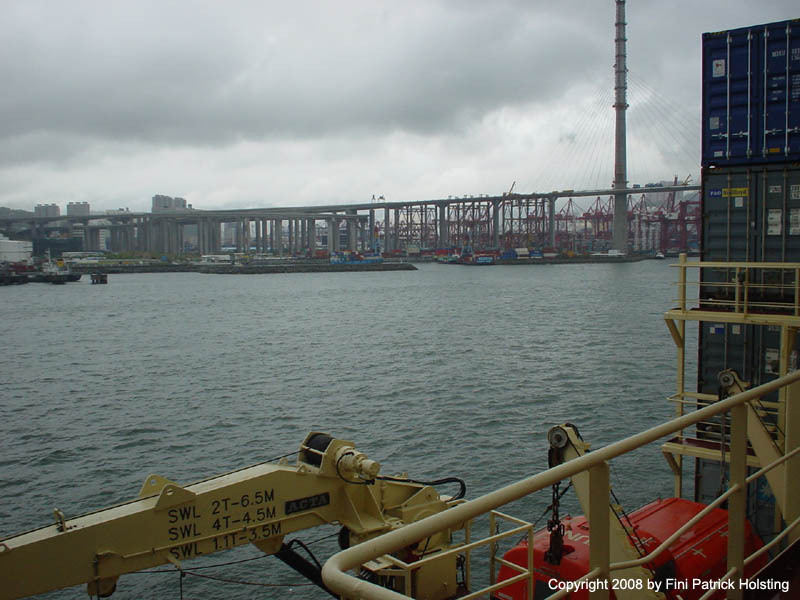 The bridge was being constructed right over the entrance to the basin where we were due to be berthed. 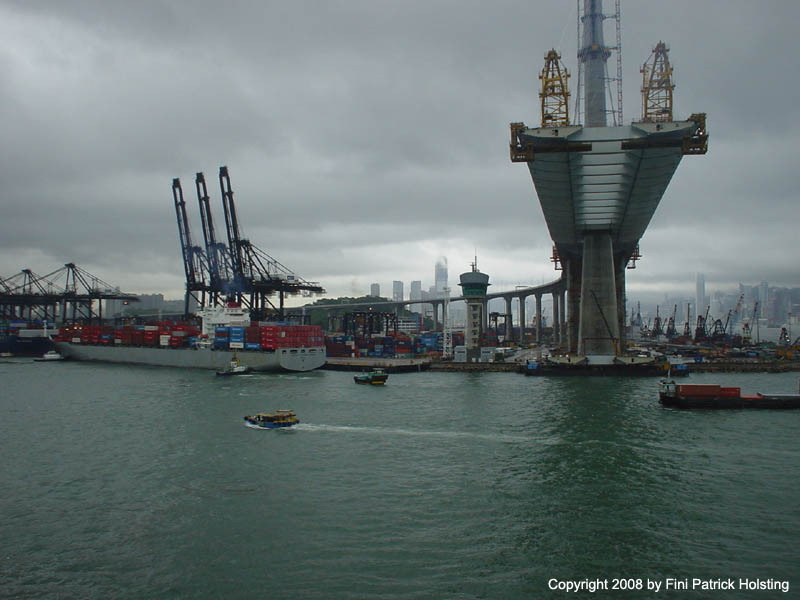 Another view of the unfinished bridge, as a K-line container ship is aided towards the berth. A forrest of cranes, booms and concrete pillars, the port of Hong Kong is truly a huge and busy yet still expanding industrial area. 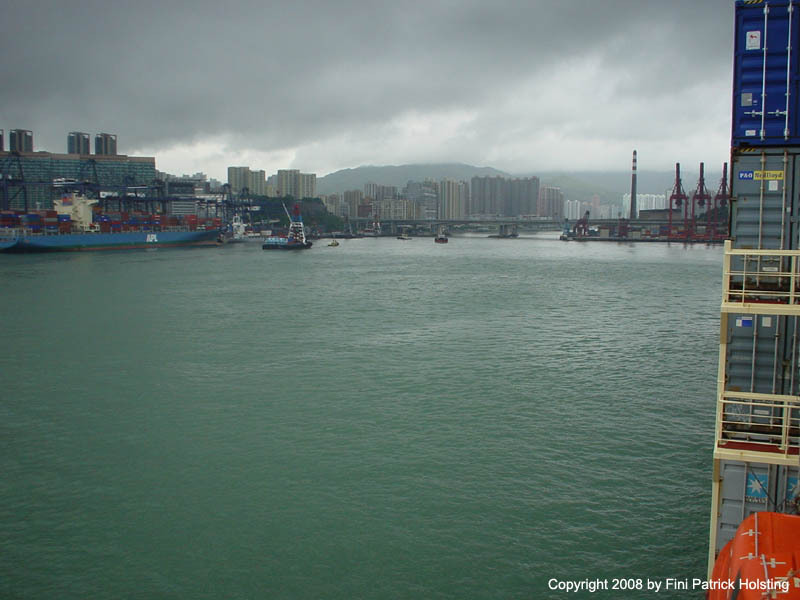 The city is very close to the port, making Hong Kong an extremely popular place for sailors to go ashore. 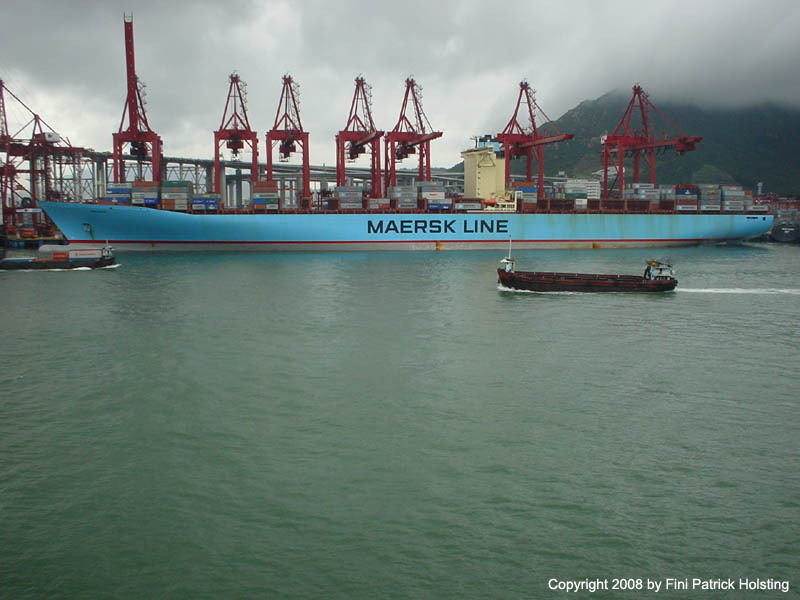 The Ebba Maersk, sister ship to Emma Maersk (and completely alike), the largest container ships ever built and currently also the world's longest ships still in use. 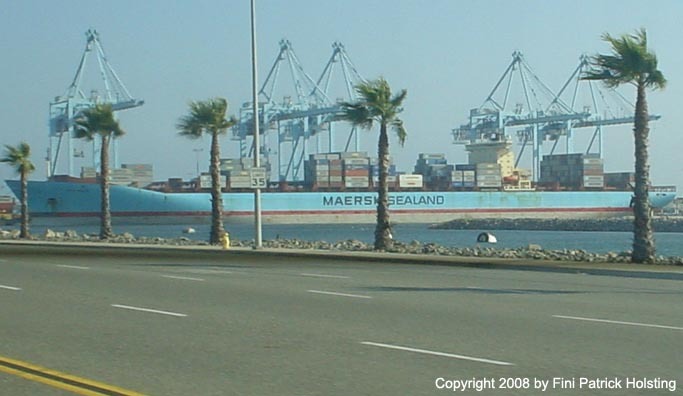 Another view of Ebba Maersk. Officially she can carry the equivalent of 11,000 TEU, while other sorces have the capacity as high as 15,000 TEU. 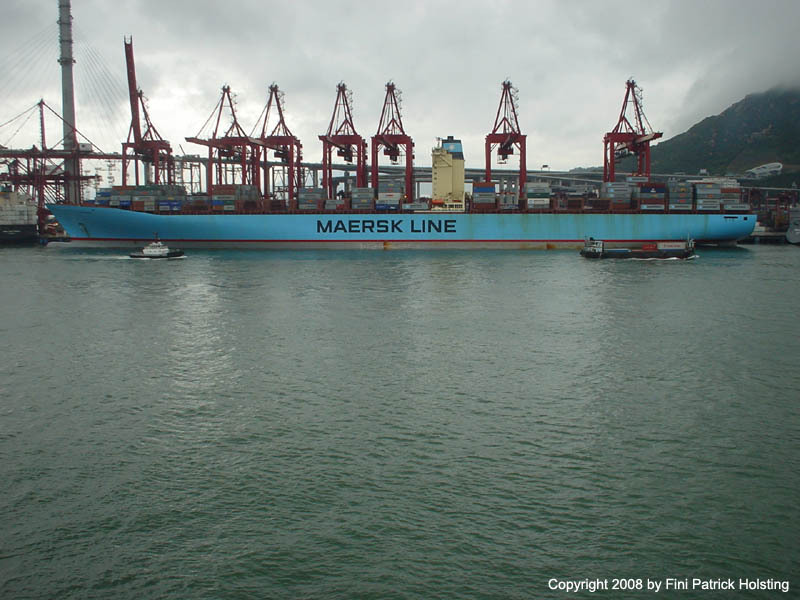 Ebba Maersk is one of 8 E-class container vessels built for A. P. Moller - Maersk A/S by Odense Steelship Yard (Lindo). They are 397 meters long. 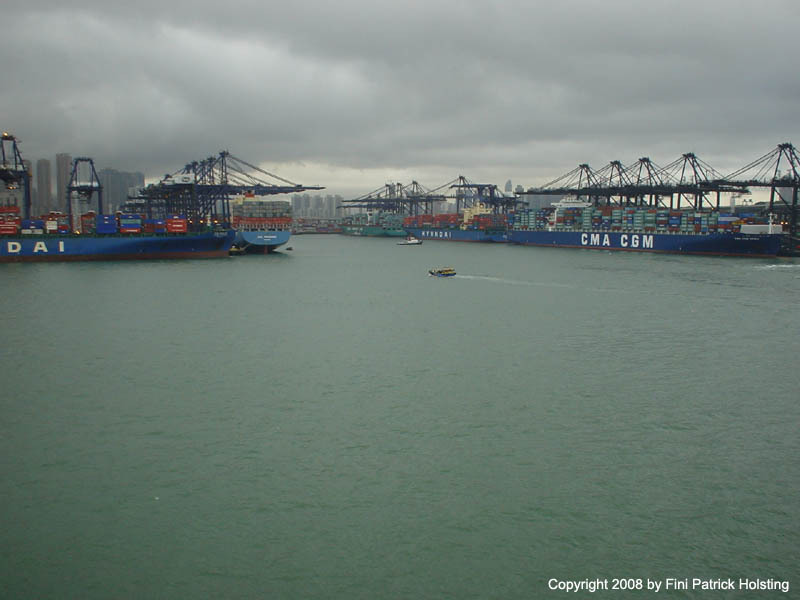 Truly a meeting point for large container ships, Hong Kong is one of the busiest ports in the world. Warehouses, trucks, cranes and lots and lots of containers fill the pier where we berthed, all of it overlooked by the numerous skyscrapers of the city. 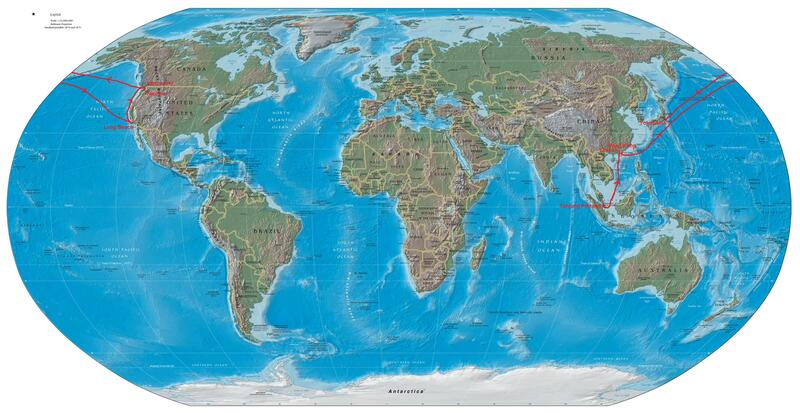 After Hong Kong it was 14 day sea passage across the Pacific Ocean to Long Beach, California. After a busy coastal schedule, these trips are often welcomed by crew, and provide the perfect opportunity for getting some of the bigger maintenance tasks done. 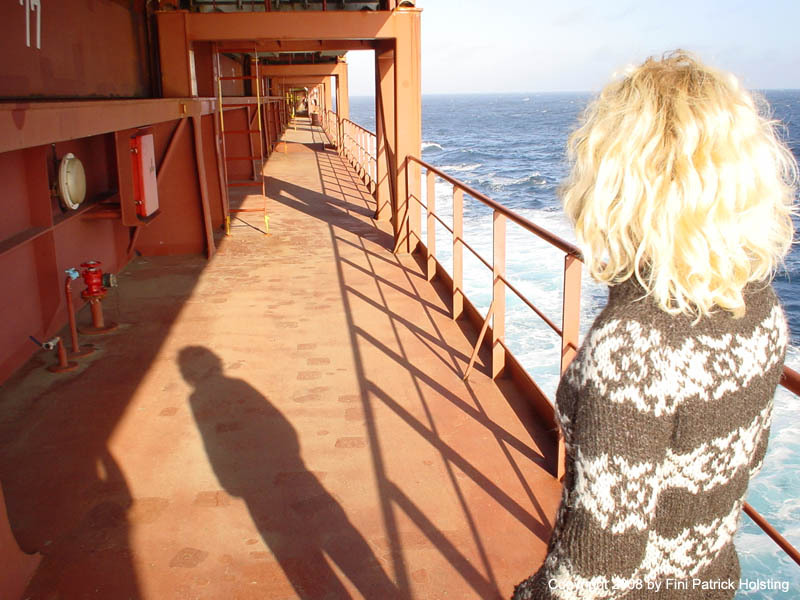 Enjoying the clean air and warm sun in the bow of Sofie Maersk somewhere in the Pacific Ocean. A fine July early evening in the Pacific Ocean a couple of days from the coast of California. What better scenario for a relaxing after-work stroll down the upper deck passage way? 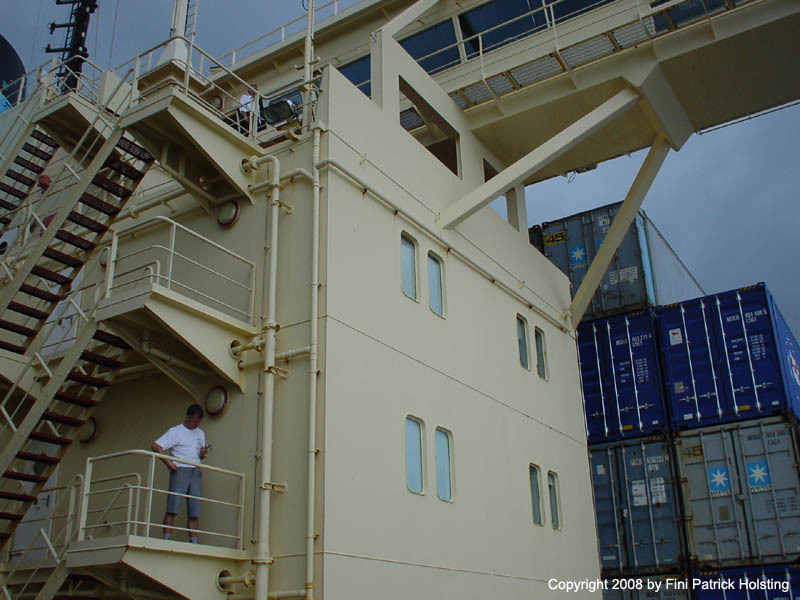 Port side of the accomodation, with the S-band radar scanner visible in the top left. 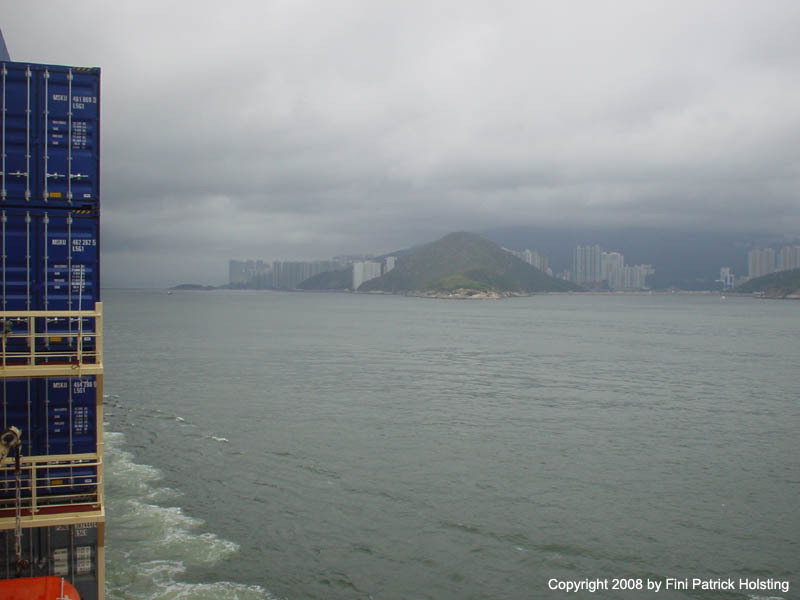 The black mast beside it is the so called "Christmas tree", and carries many of the ship's navigation lights.